I have spent the last 12 days on the road, giving evangelism conferences in North Carolina. that they can do evangelism in their ordinary life. that they don’t have to be brave. Many people come to our conferences with apprehension about evangelism — stereotypes, fears, and lots of negative emotions. What they find is confidence. Almost each one filled out a 3×5 card at the end with 3 measurable goals they wanted to accomplish for having attended. I was moved by some of the personal goals that people wanted to reach as a result of sitting under the teaching. People they wanted to pray for, talk with. Training steps they wanted to complete. If people accomplish what they set out from this seminar to do — there will be changed lives. Not only for these who attended (having found greater confidence in sharing their faith), but for those who will get to move closer to the Savior because these conferees are cooperating with the Holy Spirit. The first was co-taught with Brad Long, executive director for PRMI. 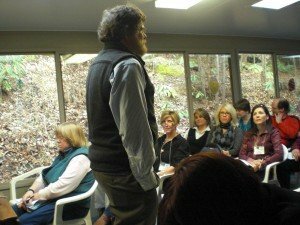 We met at a retreat center, the Community of the Cross, in Black Mountain NC. About 35-40 people attended throughout the event. I met a scholar pursuing his PhD in Evangelism, a group of people from First Scots in Charleston, and many others who blessed my life this week being with us in Black Mountain. I think we counted 5-6 different denominations from Presbyterian, Christian Reformed, Foursquare, Non-denominational, Methodist and Baptist. There may have been a few others. We introduced some new material on pursuing our calling as witnesses, some to a more specialized calling of evangelist. This particular group had at least 6 different people in the process of going to the mission field for both short term and long term work. 4-5 Different Countries. Some time was spent in lecture, practice, and prayer to round out a full experience. I was stretched in my leadership and the group shared with it’s teachers how they were stretched and blessed as well. Sunday night, I was given the opportunity to bring the sermon at Capilla Cristo Redentor, a Spanish language Assembly of God. They are one of our supporting churches in our evangelism training work. The word for the evening was on Walking to Recovery: surviving life events that turn out wrong. Using some of the Psalms for a foundation, we looked at life circumstances that are beyond our control: enemies that attack us, economy going to shambles, stressors in our life that are not of our own sinful doing. We looked at things that didnt’ turn out like we expected: the immigrant who comes to America for a better future and can’t find a job, the business owner who launched a business that failed, people who feel like “they missed it” because life didn’t turn out as planned. Walking to Recovery for the believer was all about being aware of God’s presence in the midst of out of control circumstances. Grabing on this God’s promise that He will never leave us. Following the practice of the psalm writers of prayer and adoration. This led to a time of deep ministry as people responded to the word and poured out their hearts in prayer, some with tears as they unloaded their burdens upon the One who could give them rest. Monday through Wednesday was in Coastal Carolina Presbytery giving day long Fear Free Evangelism seminars in different locations, plus meeting with smaller groups over dinner for discussions of evangelism in their particular context. 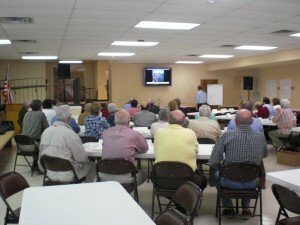 About 80-85 people, nearly 50 churches represented. All were Presbyterian. This seminar wasn’t just sharing information — it was full of practice, discussion, and prayer. The Holy Spirit touched hearts as we asked God to show us where He was calling us, as we sought to be filled with the Holy Spirit that we might be his witnesses. 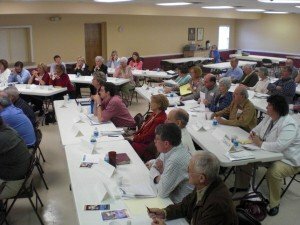 If you would like more information about hosting such events in your presbytery or region, simply contact me to begin the discussion.